My uncle is a blueberry farmer so I spent many summers as a child on his farm eating as many blueberries as I could get my hands on! I recall these childhood memories every time I eat this delicious fruit so I couldn’t wait to pair them with one of my all-time-favourite dishes…pancakes! Pancakes are the ultimate ‘feel-good’ dish. These pancakes are light and fluffy, yet filling and hearty. 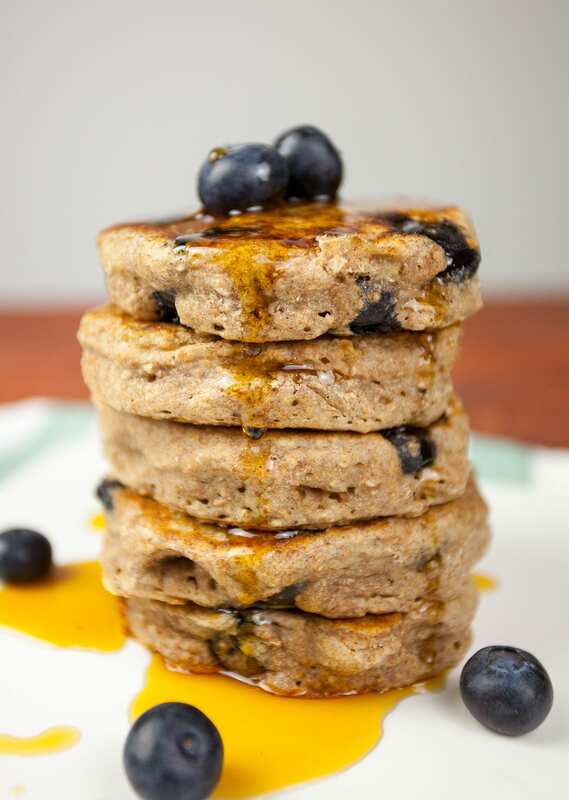 We serve ours with maple syrup and extra blueberries on top! 1. Pour the milk and lemon juice into a small bowl, stir, and leave for 10 minutes until the consistency transforms into buttermilk. 2. In a mixing bowl combine the flour, baking powder, bicarbonate of soda, salt, cinnamon, and sugar and make a well in the centre. 3. Mash the banana well and then add to the centre of the mixing bowl. 5 Heat a little coconut oil in a frying pan on a medium to high heat. Once hot, add 2 tbsp of pancake mixture for each pancake. 6. Fry for 1-2 minutes on each side. 7. Serve with maple syrup or your favourite topping! Why do you use self rising w w flour? The recipe has baking powder and baking soda in it. I make my own ground w w flour so how can I make this recipe with it? Could you use another fruit in place of blueberries? Such as strawberries? Hi Krish, yes you can try with lots of different berries! How much baking powder should i use incase i have ordinary whole wheat flour and dont want any baking soda in my pancakes. I don’t like bananas, is there a way of making the pancake without them? Thanks! !